Vice President Mike Pence recently drew attention to the persecution of Christians around the world, telling a summit in Washington, D.C., that “no people of faith today face greater hostility or hatred than the followers of Christ.” In the same speech, Pence singled out “the suffering of Christians in the Middle East,” promising that the U.S. would act to protect Christians in that part of the world. Some of the vice president’s statements on Christian persecution comport with data from a recent Pew Research Center report on global religious restrictions in 2015. Christians have been harassed in more countries than any other religious group and have suffered harassment in many of the heavily Muslim countries of the Middle East and North Africa. 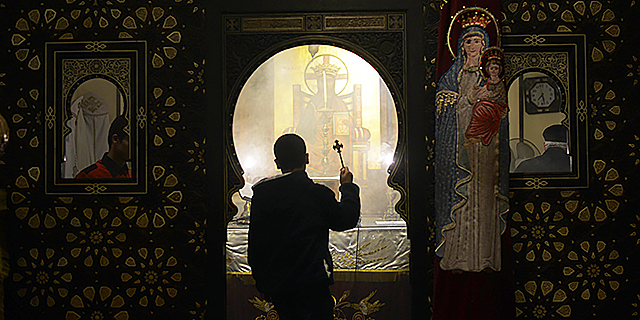 But the report also shows that this widespread harassment is due in part to the huge size and broad geographic dispersion of Christians around the world, and that the Middle East is just one of a number of regions where Christians have faced harassment. Christians were harassed by governments or social groups in a total of 128 countries in 2015 – more countries than any other religious group, according to the report. But there also were 2.3 billion Christians in 2015, more than any other religious group. Large populations of Christians are present in all but a few parts of the world: Roughly two-thirds of the world’s countries, for example, have Christian majorities. 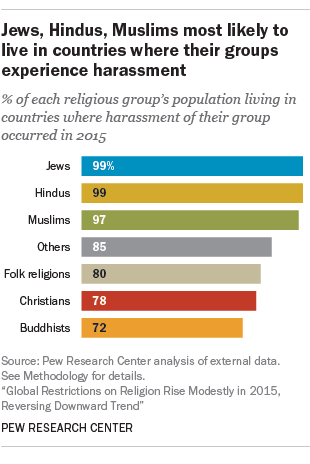 Due in part to the large number of Christian-majority countries, Christians were actually harassed mostly in Christian-majority countries. In some of these countries, the Christian majority was itself harassed, often by the government. For example, in Nicaragua – where an estimated 59% of the population is Catholic – the Catholic Church reported that the government monitored its emails and telephone conversations and granted financial support for churches based on the clergy’s political affiliation. The church also reported that the Nicaraguan government used Catholic traditions and symbols when promoting political agendas, saying it undermined the church’s religious authority. In other Christian-majority countries, Christian minority denominations were targeted. For example, in Eritrea – where Eritrean Orthodox Christianity is the dominant faith – Jehovah’s Witnesses reported being unable to obtain official identification documents because of their faith. In addition, the majority of religious prisoners in Eritrea in 2015 were Protestants, namely Pentecostals and evangelical Christians. While Christians were harassed in countries far beyond the Middle East and North Africa, they faced significant harassment in this region, too. In Syria, for example, Christians reported that tolerance within society was on the decline as extremist groups gained influence. And in Egypt, Christians were killed for having converted from Islam or simply because they were Christian. For example, in January and February 2015, two Christian men were killed – one of these murders was claimed by the Islamic State – in the North Sinai city of Arish, according to a Christian advocacy group with a presence in the region.